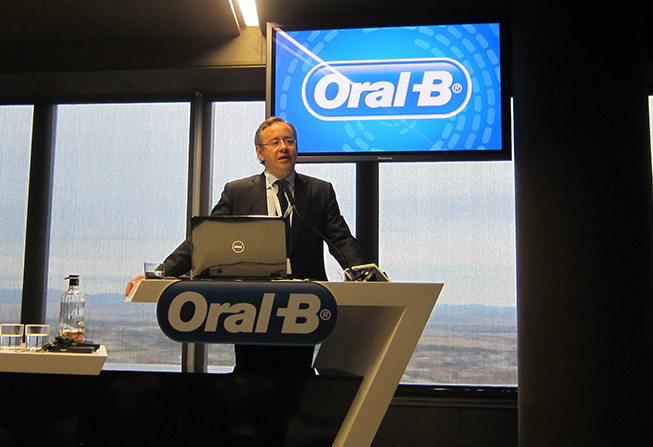 By invitation of Oral-B, I had the opportunity to present the FDI Vision 2020 to an important group of dental professionals, in Madrid, early this month. Terima kasih! 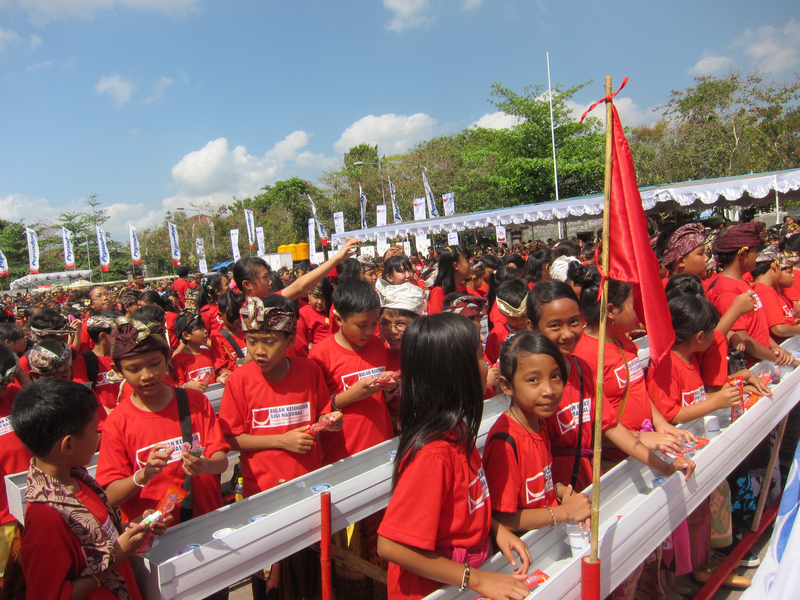 Thank you Bali, Indonesia, for the National Oral Health Month 2012! 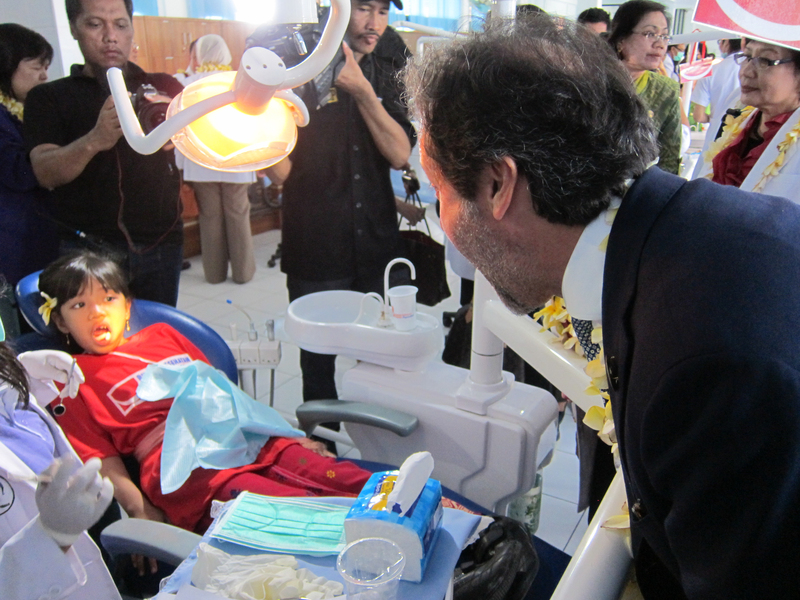 Invited by Unilever, I had the opportunity to get closer to the reality of oral health in Bali. I met with government members, academics, professionals, industry and population. 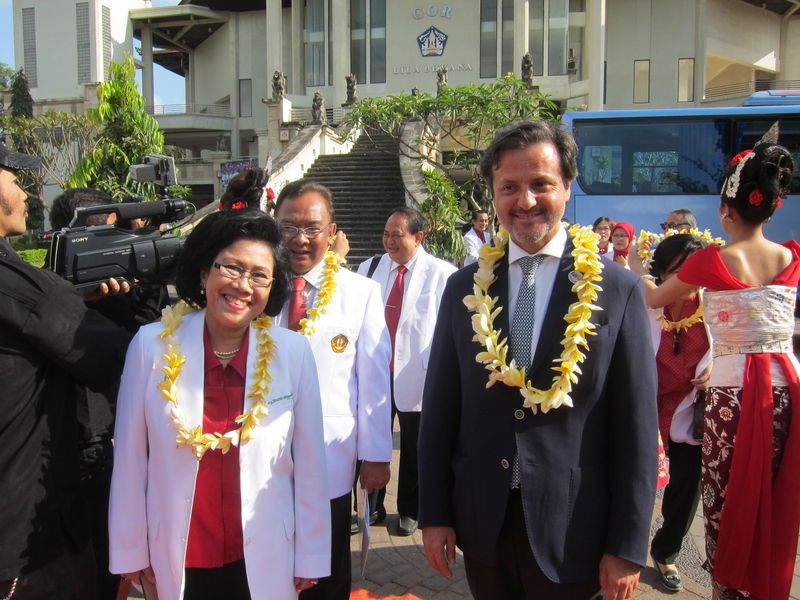 I was welcomed by the president of the Indonesian Dental Association, Zaura Rini Anggraeni. 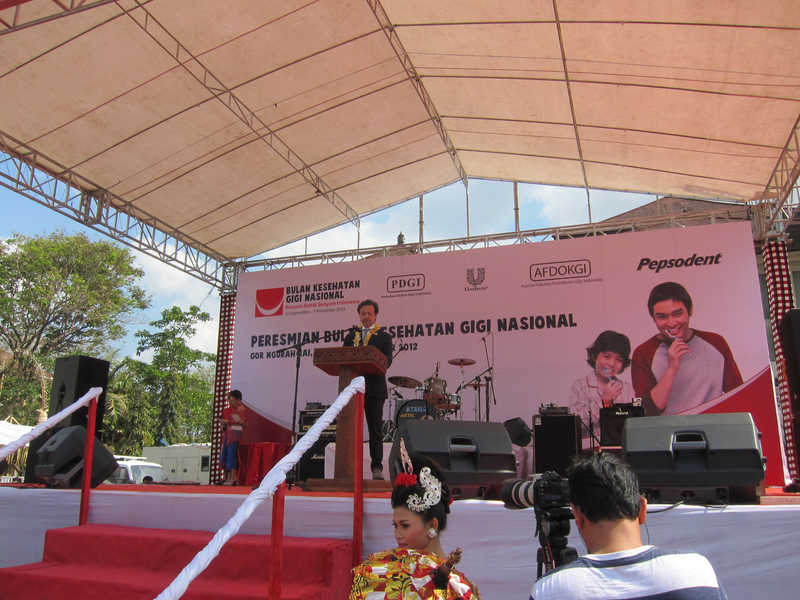 Diah Setia Utami, directorate general of health care – Republic of Indonesia. 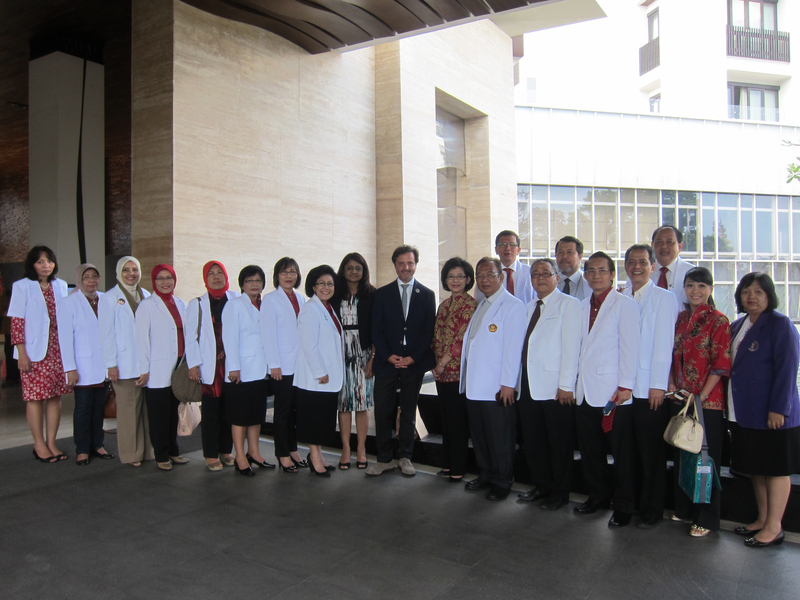 Meeting with deans from sixteen Indonesian dental schools. 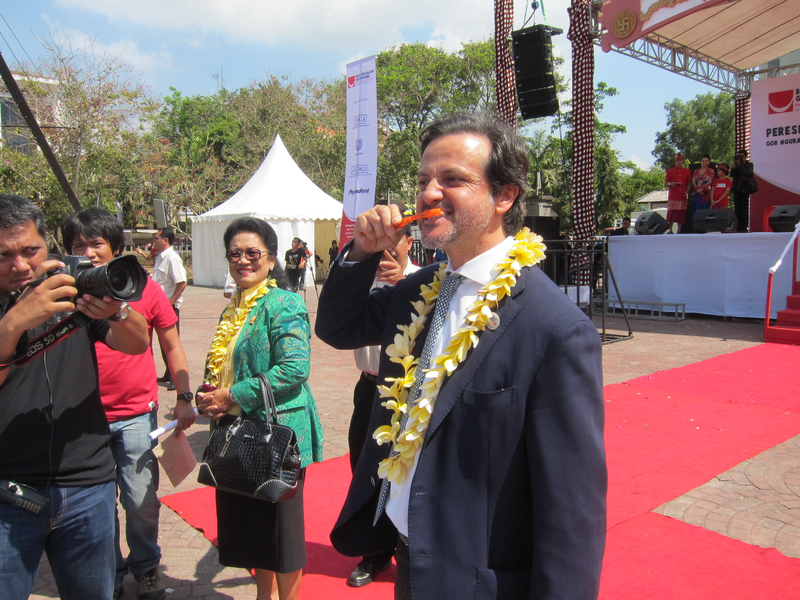 National oral health month 2012 opening ceremonial. 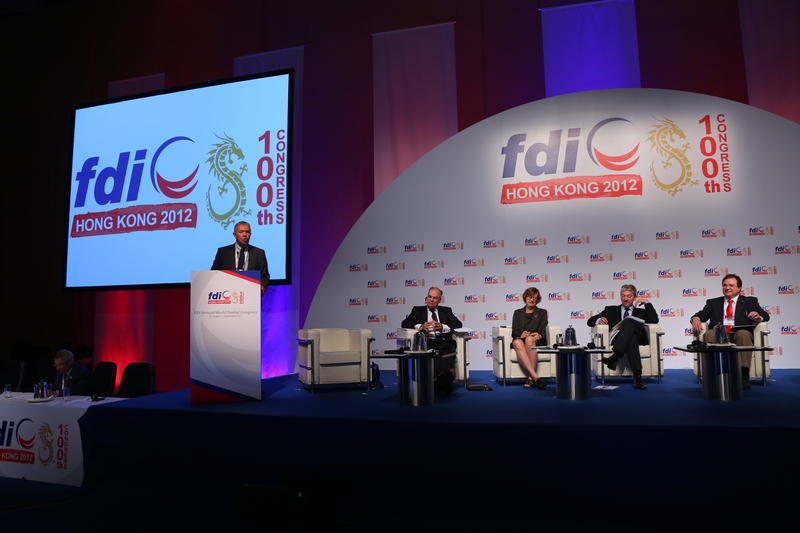 FDI main projects were outlined during my speech. 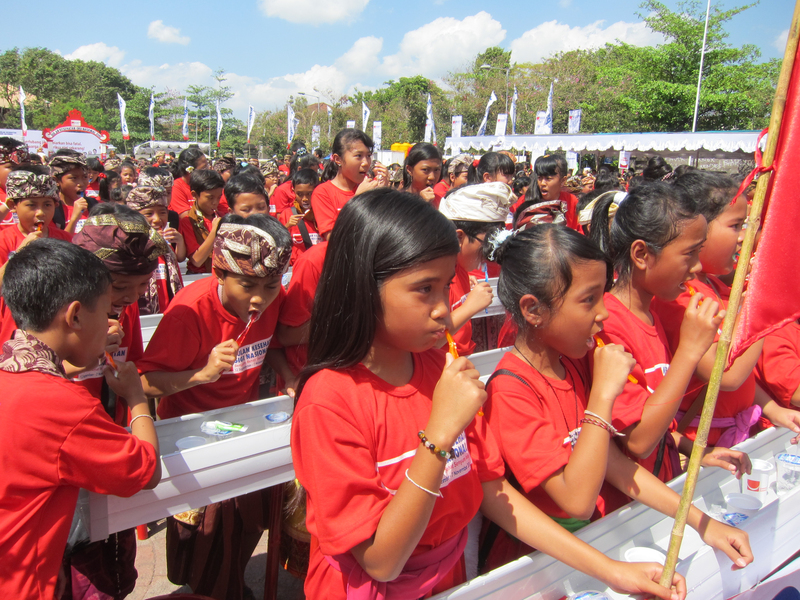 More than five thousand children learning how to brush their teeth. To teach, first we have to give the example. 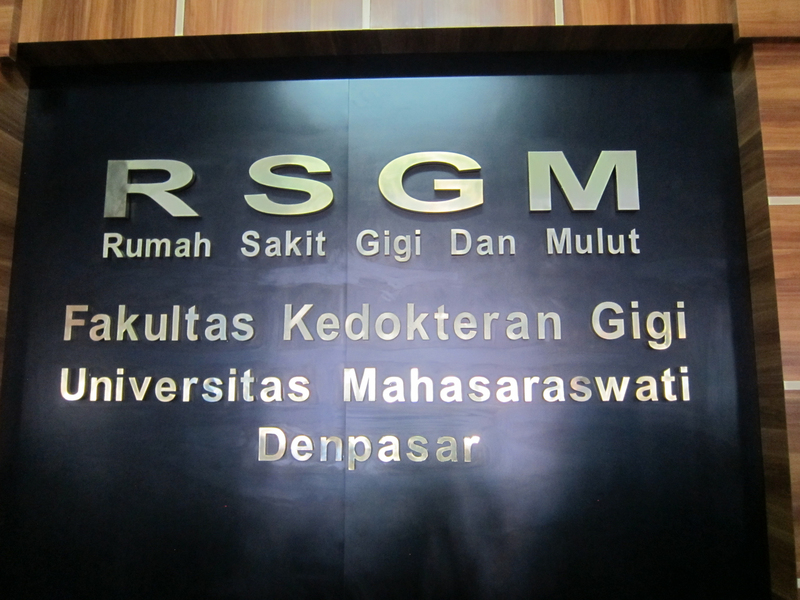 Oral screening at the local faculty. Interview with the national television. 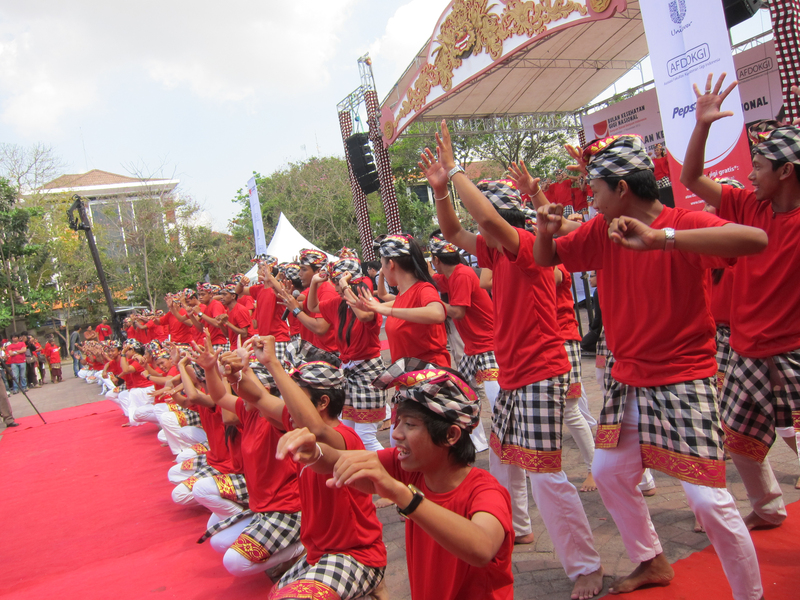 Bali is considered by many as one of the world best island. Indeed, its an unique place, but it is the Balinese people and culture what makes this island different. I would like to address my appreciation to the committee of the National Oral Health Month in Indonesia: PT Unilever Indonesia, Tbk. 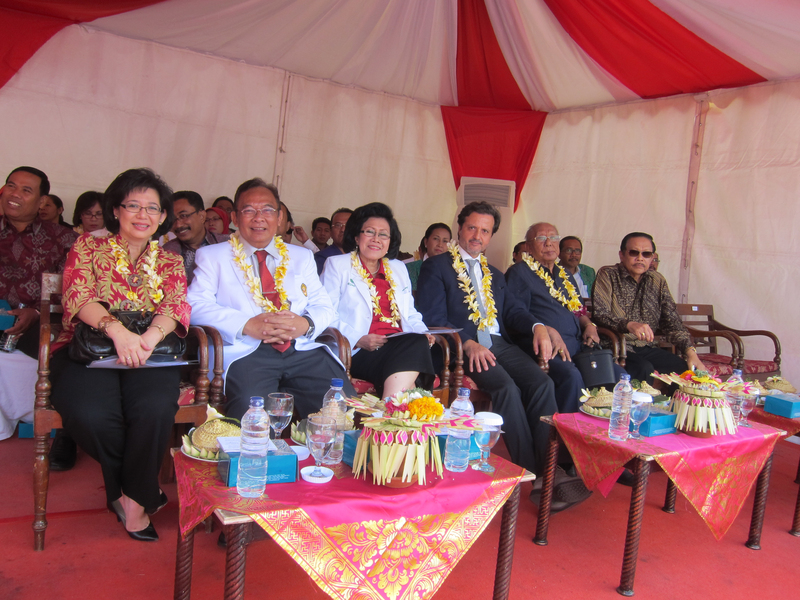 ; Indonesian Dental Association (PDGI); and Association of Dentistry Faculty Indonesia (AFDOKGI) for their collaboration in implementing the program for the third time. 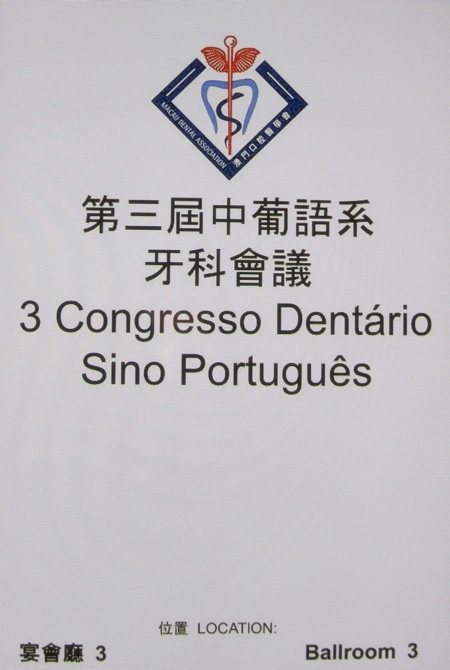 After the 100th FDI Congress in Honk Kong, I had the opportunity to attend the II Sino-Portuguese Dental Congress in Macau. 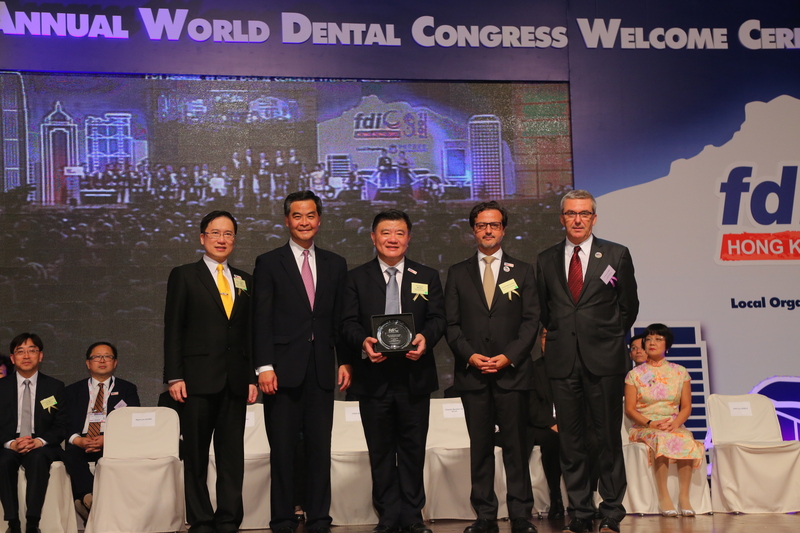 Many thanks to the Government of Macau, to Dr. Peter Pang, president of Macau Dental Association, to Dr. Carlos Augusto, chair of the organising committee and Dra. Cristina António, recently elected president of MDA. 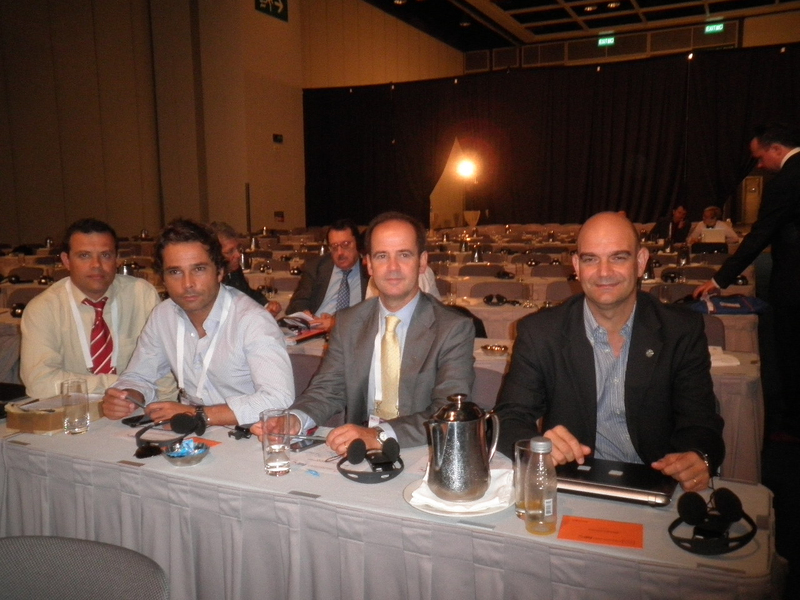 Paulo Melo, president of the Board of the Portuguese Dental Association, Me, Carlos Augusto and Jaime Portugal, president of Portuguese scientific society SPEMD. 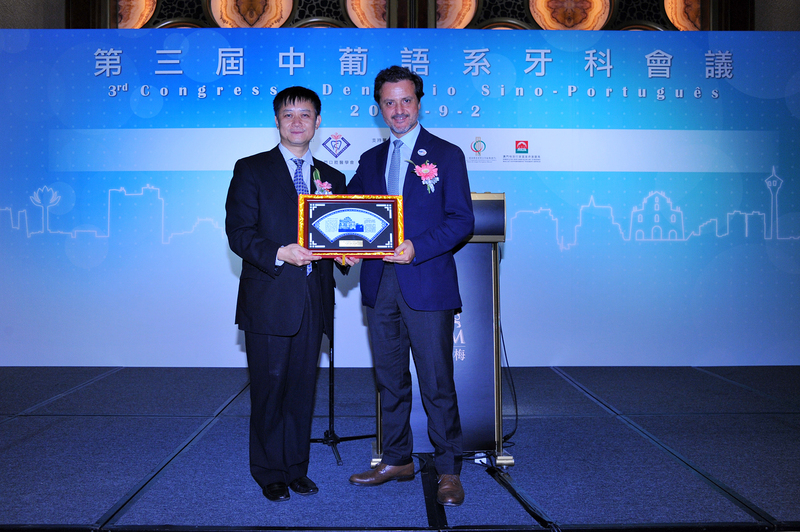 Me and Peter Pang, presidente of Macau Dental Association. 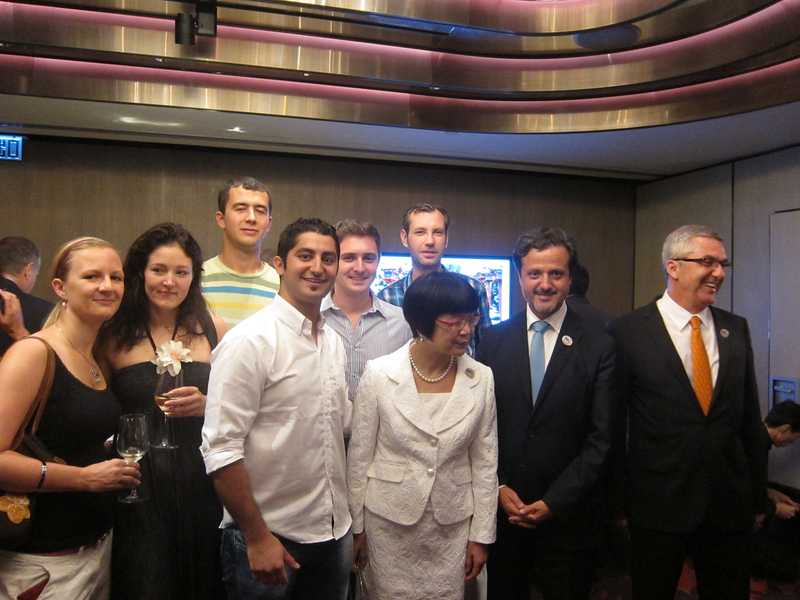 Group photo of the Portuguese delegation. 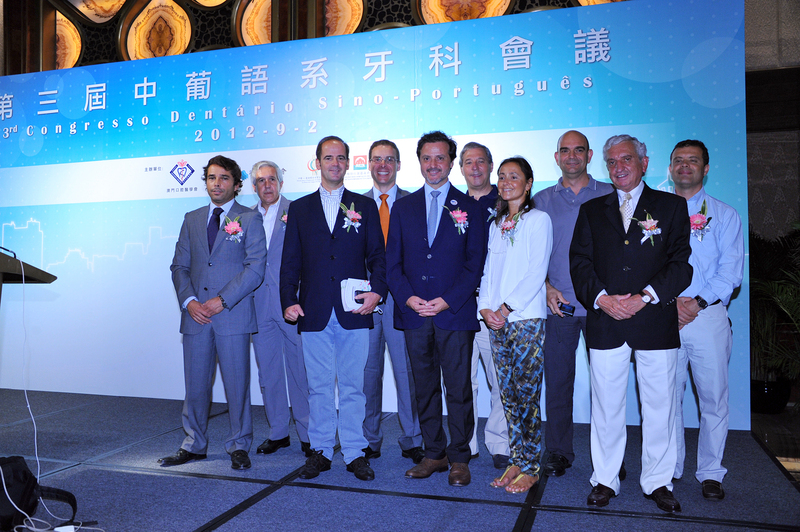 Recognition of the Macau Dental Association to the Portuguese Dental Association. 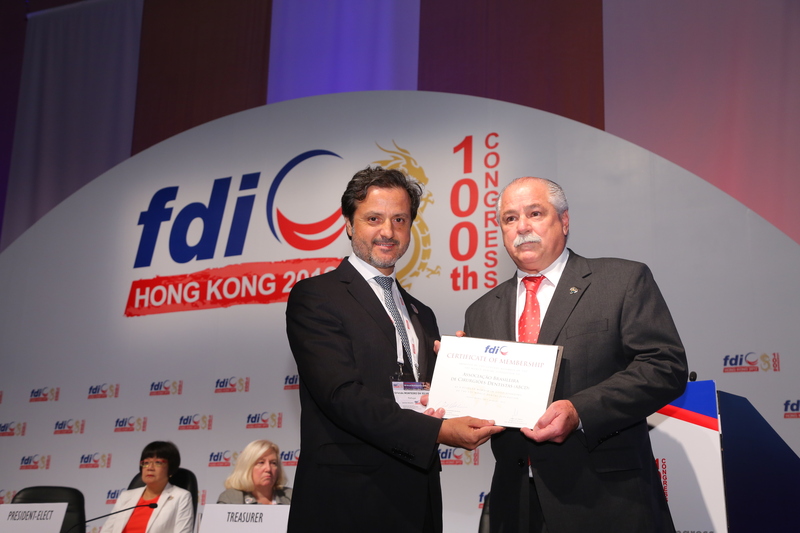 Thank you Hong Kong for the 100th FDI AWDC! 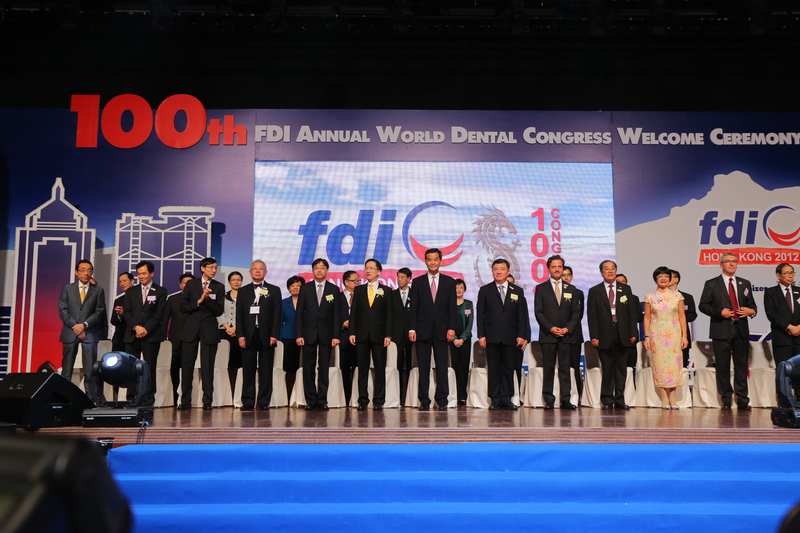 It is now more than one month since the 100th FDI Annual World Dental Congress drew to a close in Hong Kong: I would like to take this opportunity to look back and draw some conclusions and share my thoughts on where FDI is headed during the coming years. 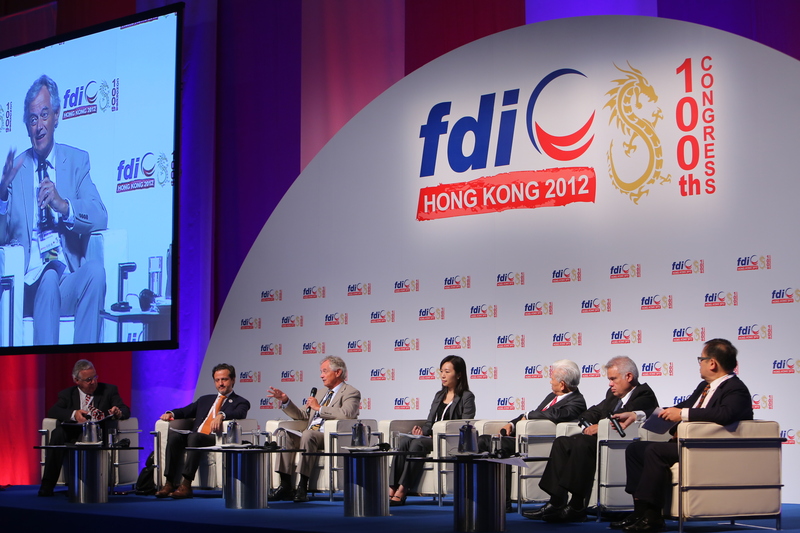 A little bit of FDI history by the occasion of the 100th congress in Hong Kong. “The dentist is a little like the sentinel at the door of the human citadel, part of its defence with physicians and surgeons; often it is he who sounds the first alarm the the whole organism is in danger. He protects the region he is charged to guard against disease. If it is destroyed he restores it and re-establishes it to such a degree as to restore a physiological function believed lost. 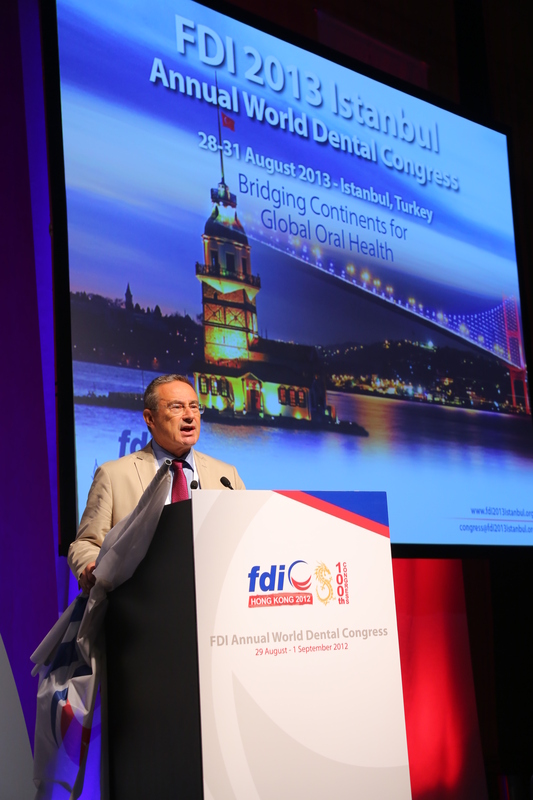 (…) So it can be said that dentistry is the most specialized, the most distinctive and the most autonomous among the medical sciences.”, FDI President, Charles Godon, inaugurating the founding of FDI (in 1900). 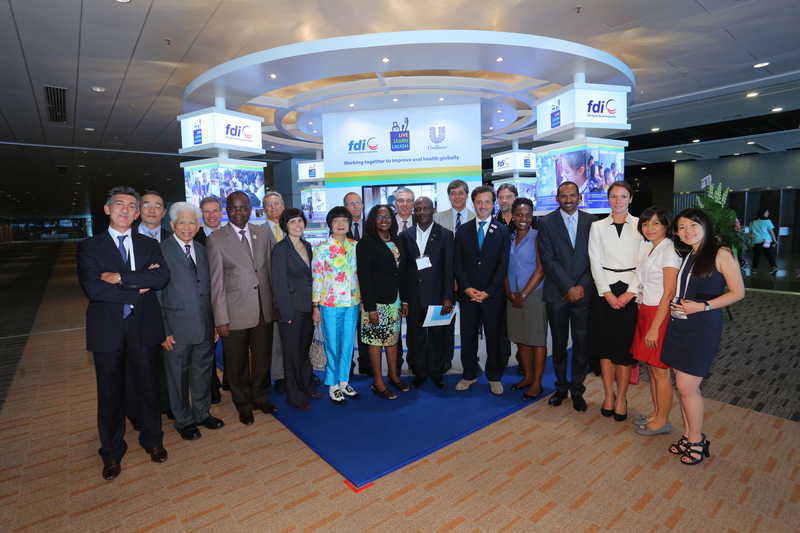 Group photo with local authorities, FDI officers and local organizing committee before the ceremony. 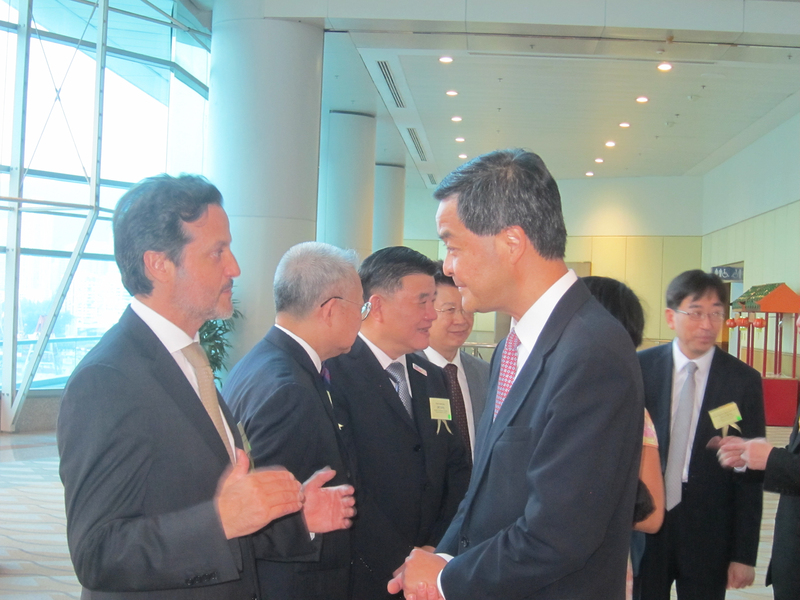 With Leung Chun-ying, Hong Kong prime minister. 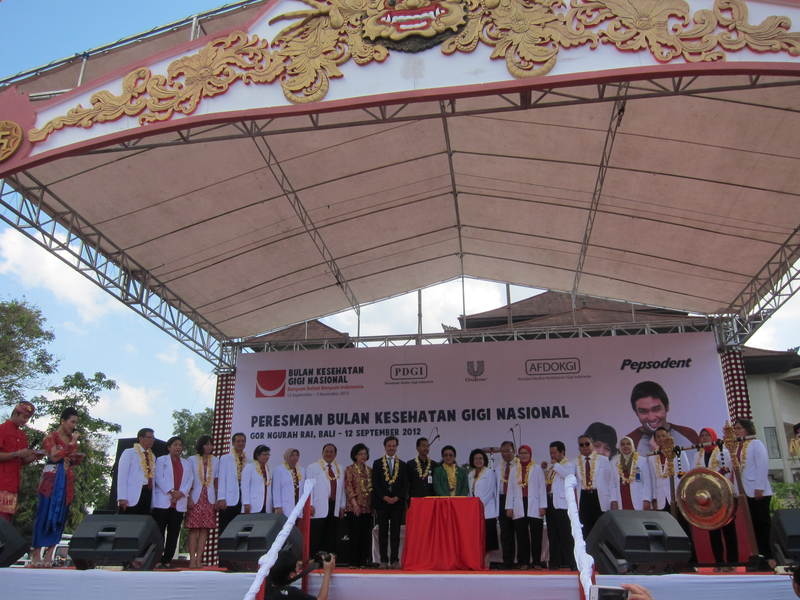 Formal opening of the ceremony. 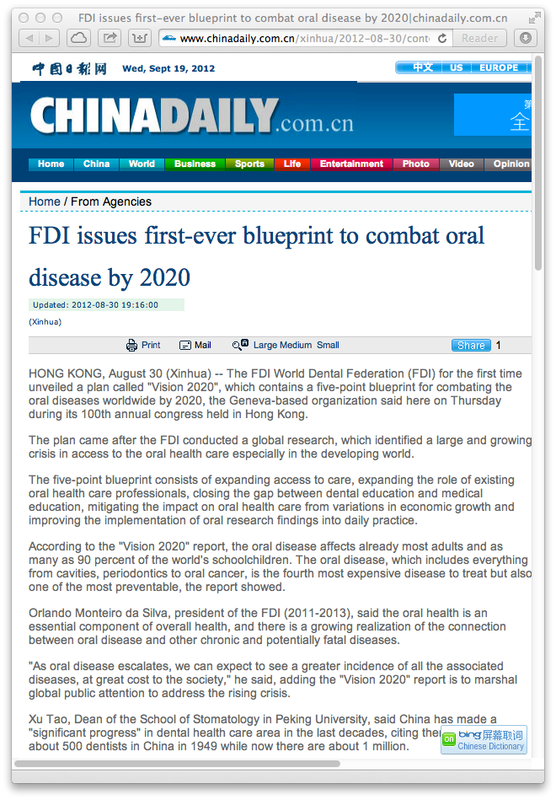 Recognition by the World Health Organization: In a recorded address, to the FDI 2012 Hong Kong Welcome Ceremony, WHO Director-General, Dr. Margaret Chan, paid tribute to the dental profession as a pioneer in the concept of preventive medicine—bearing in mind that prevention is cited as the main weapon in the fight against NCDs—and highlighted to role and outreach of specific projects such as Live.Learn.Laugh. 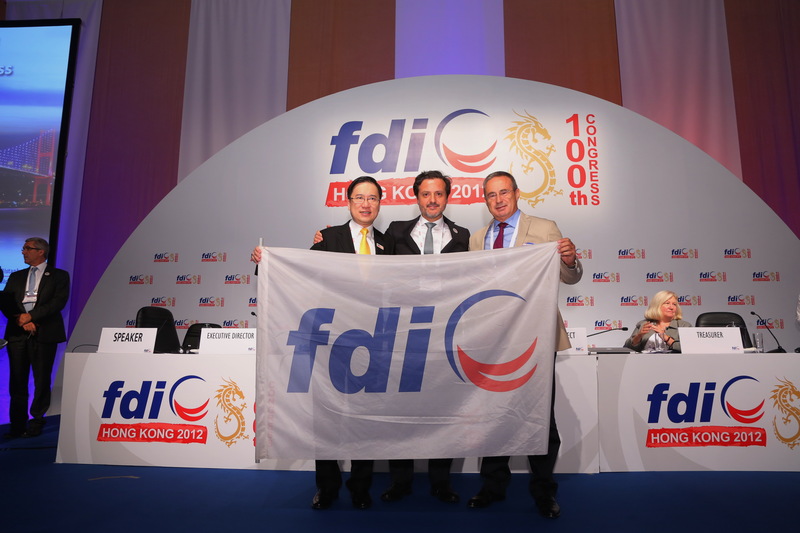 Political visibility: FDI managed to attain a high level of political visibility among the authorities of both the People’s Republic of China and its Special Administrative Region of Hong Kong. This was especially apparent at the Welcome Ceremony, held in the presence of the Chief Executive of Hong Kong and the Chinese Minister of Health. 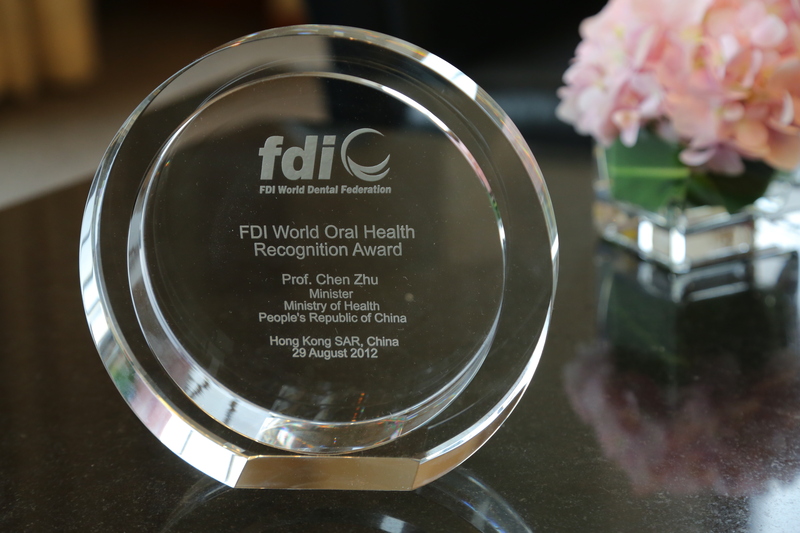 FDI awarded the latter a special Award for his contribution to oral health in China. 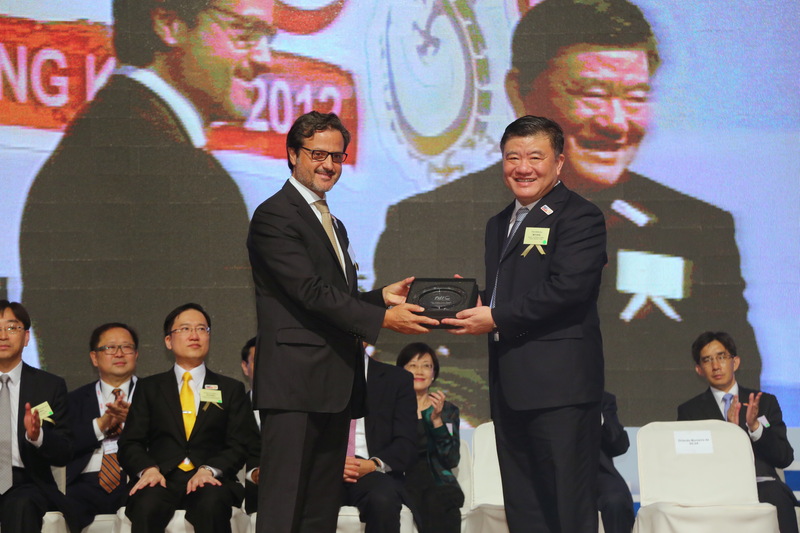 Awarding Chen Zhu, Chinese Minister of Health. 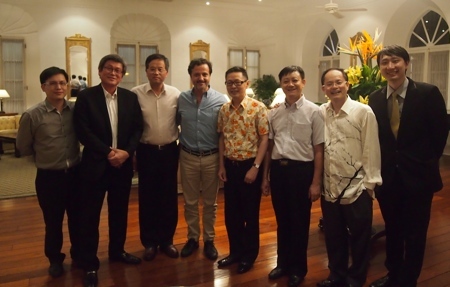 From left to right, Sigmund Leung, president of HKDA and chairperson of the local organising committee, Leung Chun-ying, Hong Kong prime minister, Chen Zhu, China Health Minister, me and Jean-Luc Eiselé. Audience from all over the world. 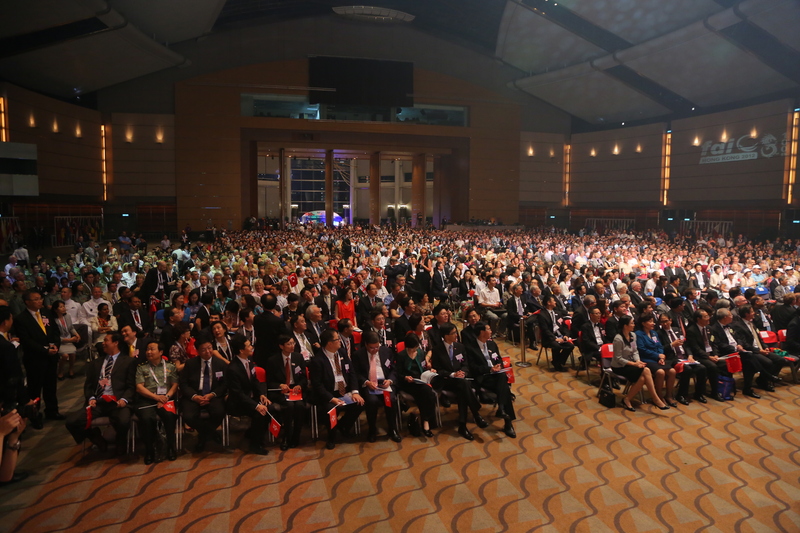 Vision 2020: A high level of consensus was in evidence among the 300 or so General Assembly delegates at Vision 2020’s first reading. 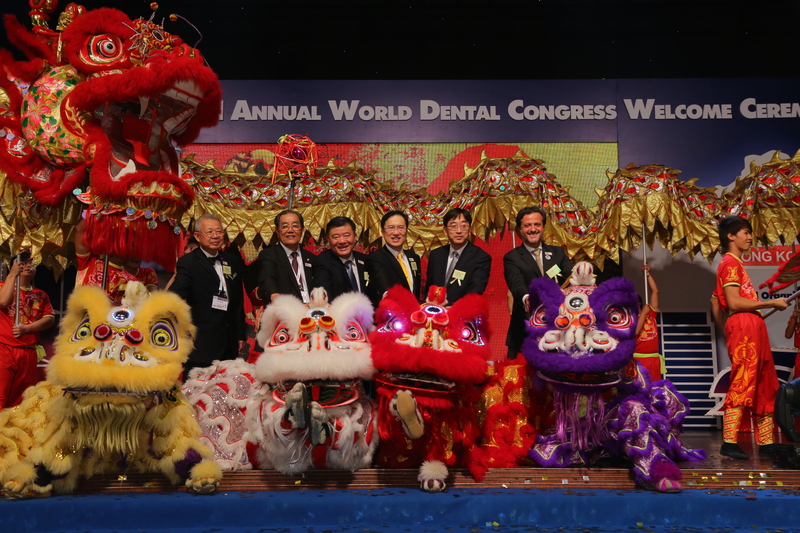 But it also generated a lively discussion on the role of the profession and it was an opportunity to reinforce our vision of the dentist as the leader of the dental team: Delegation – Yes; Substitution – No. Bearing in mind that the document was drafted, debated by all our members and committees, revised, and presented in something less than a year, this is quite an achievement. 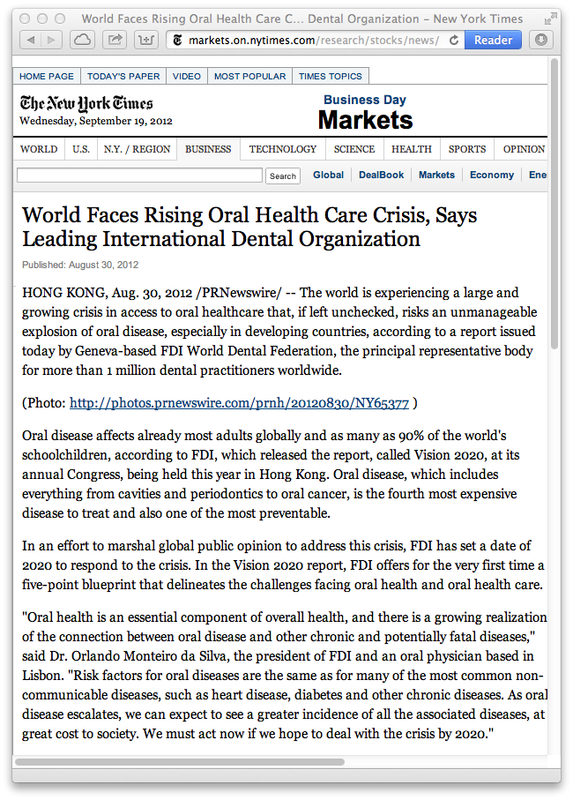 The dental profession worldwide now has an overarching vision of its future and can set about designing the policies and strategies that will get us where we want to be by 2020. 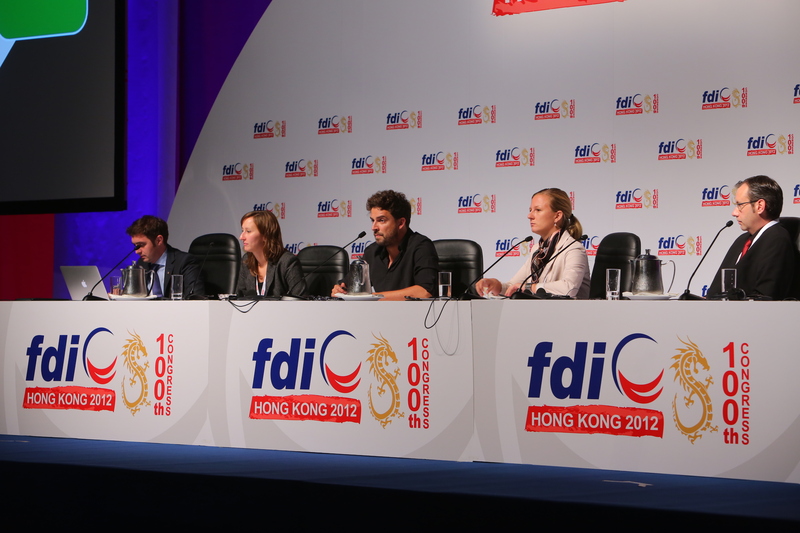 FDI Vision 2020 press conference. 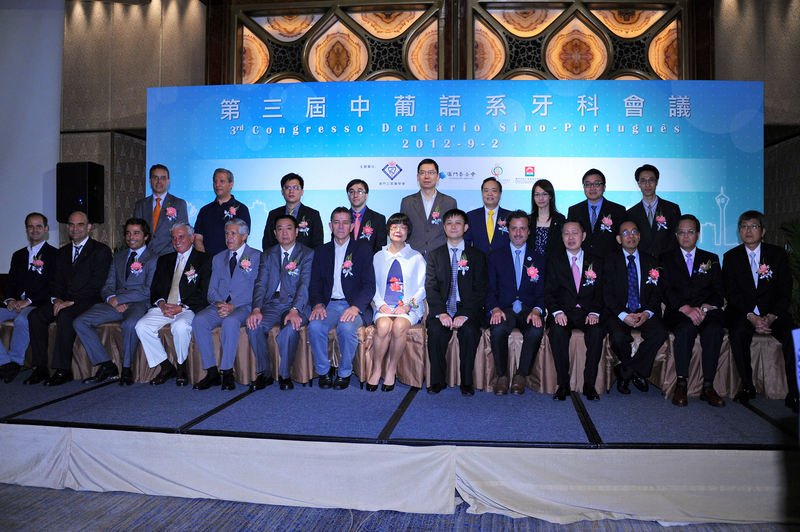 From left to right, Stanley M. Bergman, chairman and CEO of Henry Schein Inc, Tao Xu, Professor and Dean, School of Stomatology Peking University (China), myself, Michael Glick, chair of the Vision 2020 Task Team, Analia Mendez, global director of Health Programmes & Partnerships for Oral Care and Household Care categories in Unilever. Local and international media at the press conference. 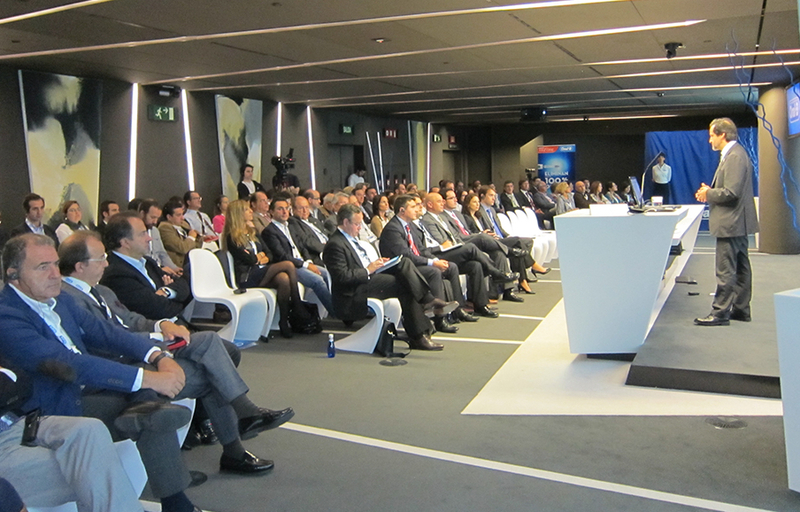 Forum Session 1 – Vision 2020. 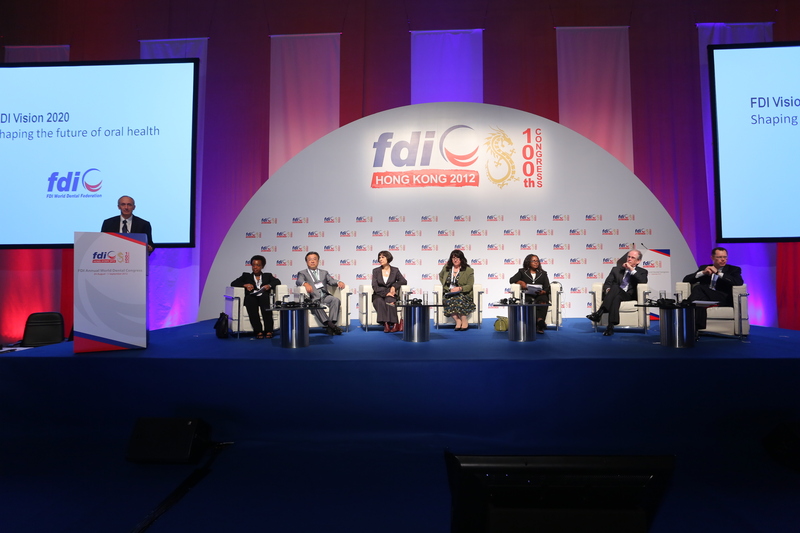 These are just a few examples of how FDI has made and is making its voice heard through advocacy for better oral health at a global level. Its impact is also felt through global channels of social communication as well as reports from Hong Kong in the world media such as China Daily and the New York Times, among others. 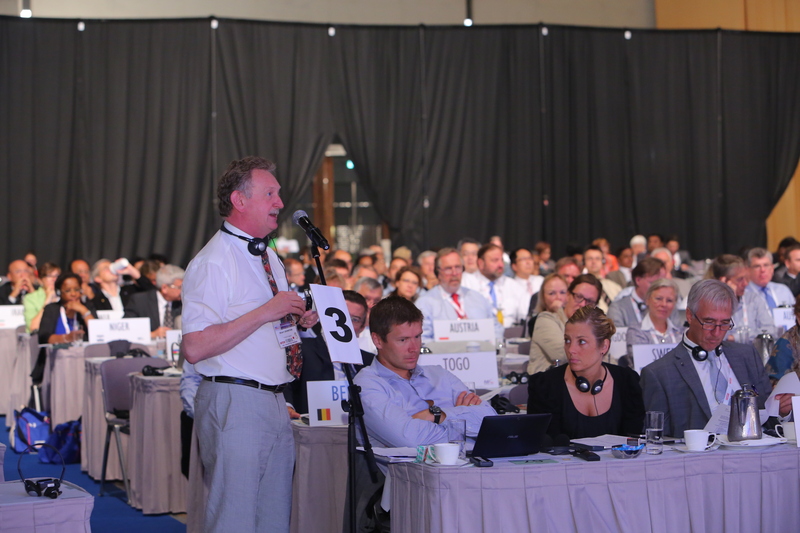 Our aim is to pursue this strategy, in line with the requirements and resolutions of the General Assembly. 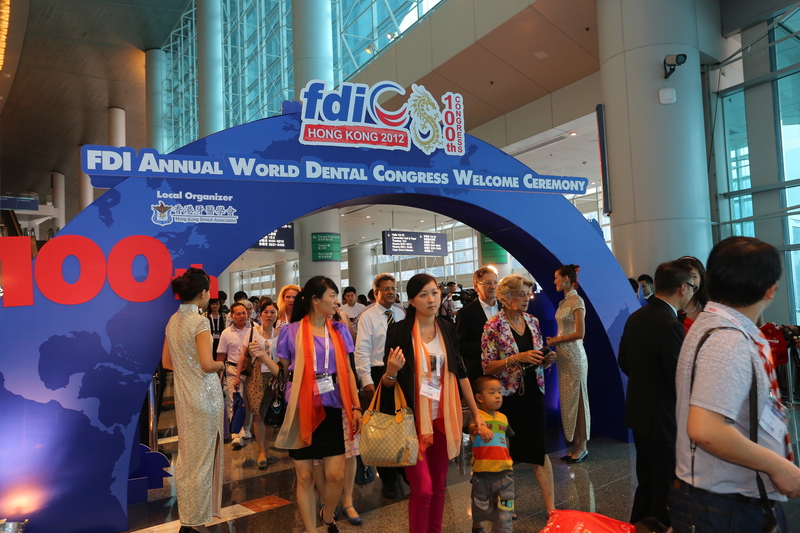 World Oral Health Forum: the inaugural edition of this new and innovative FDI event provided a real opportunity for a number of FDI stakeholders, including the dental industry, to freely discuss issues of concern. 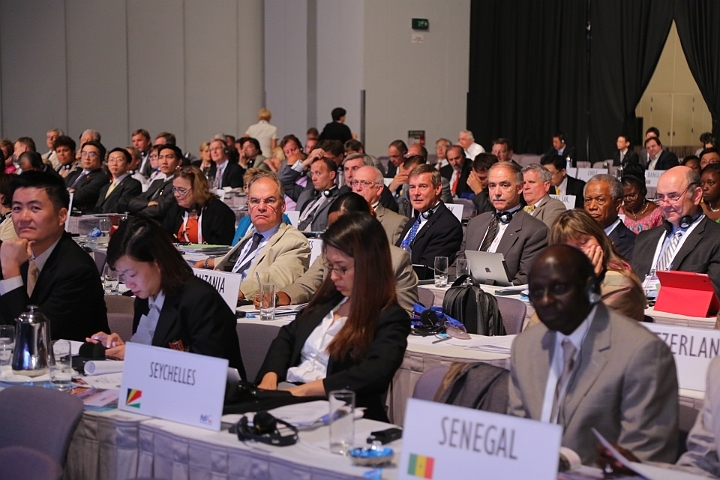 The presentations took place within the context of the General Assembly—i.e. 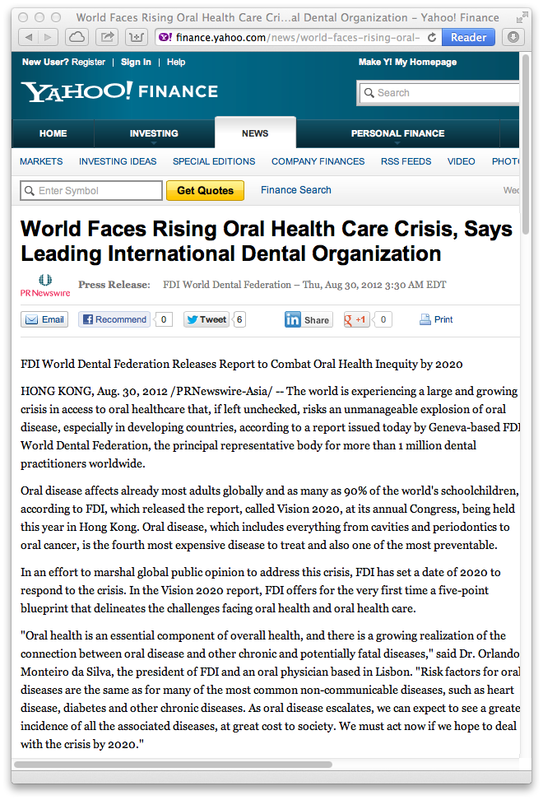 we were taking advantage of the presence of a significant number of member national dental associations—but outside its political ramifications, that is, interventions were on a personal level and did not reflect a ‘national approach’. 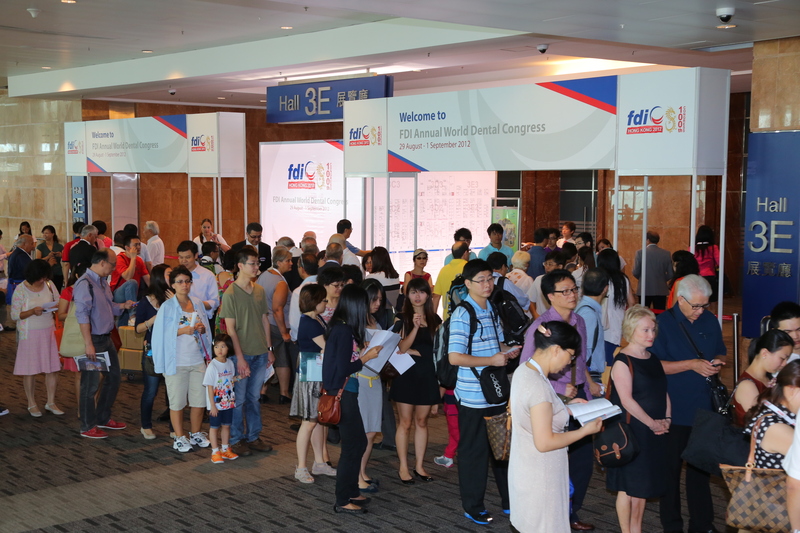 The event’s format proved a huge success for future congresses. 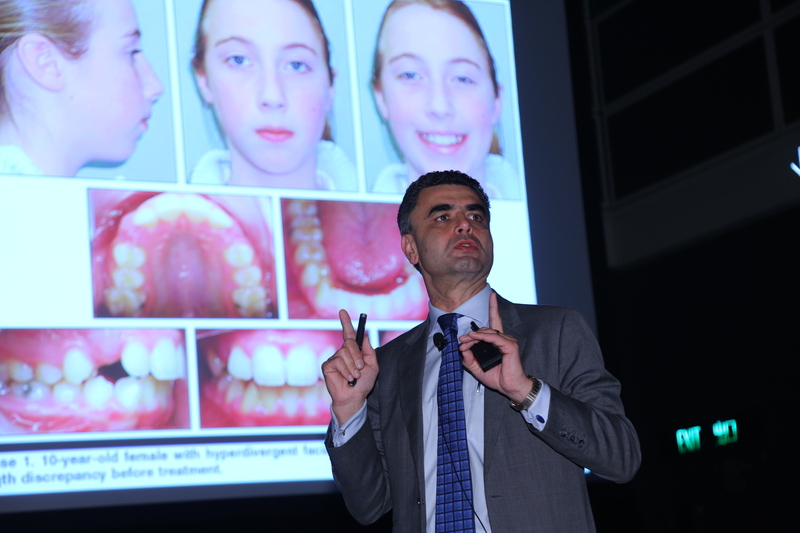 Forum Session 2 – Caries, a silent epidemic. 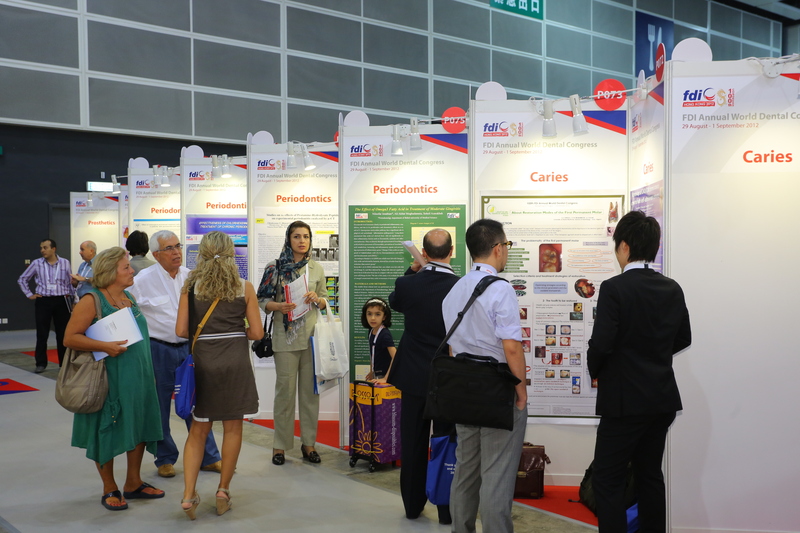 Forum Session 3 – Sustainable Development and Green Dentistry. Addressing the General Assembly A. Delegates at the General Assembly. 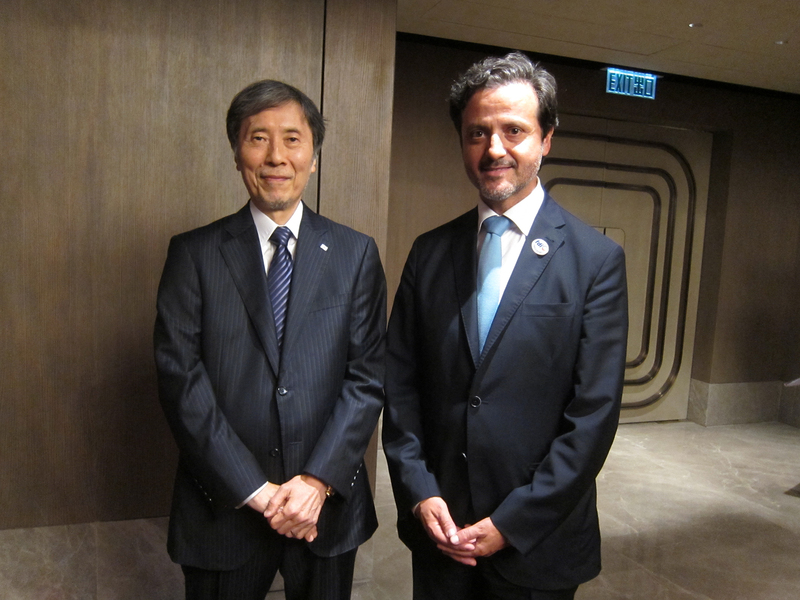 With Mitsuo Okubo, president of the Japan Dental Association. 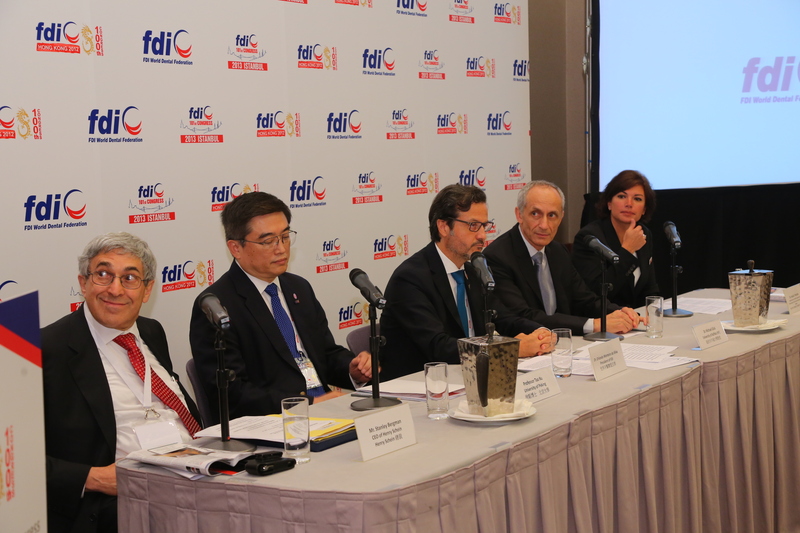 I would like to take this opportunity to welcome new FDI member associations from Argentina, Bosnia & Herzegovina, Brazil, Georgia, Germany, Mozambique, and the United Kingdom. 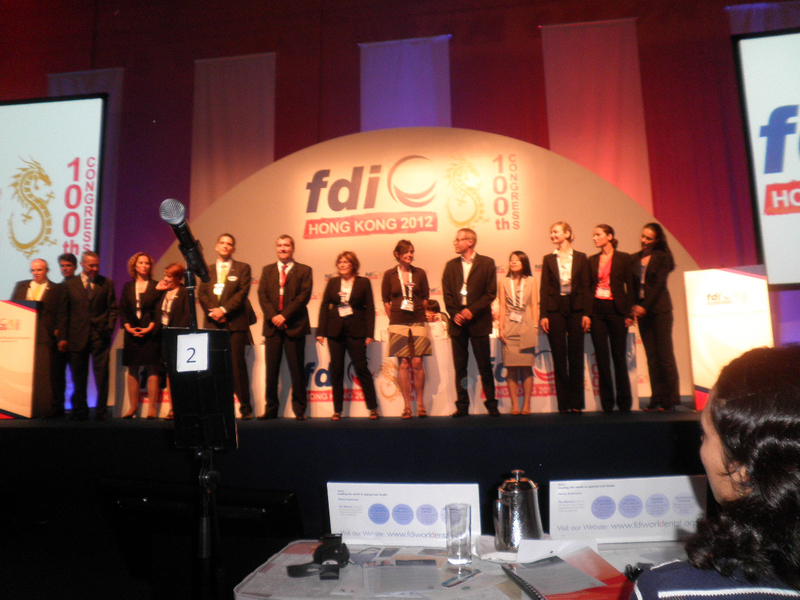 I would also like to congratulate all individuals working within FDI who were elected to posts of responsibility during the 2012 General Assembly. 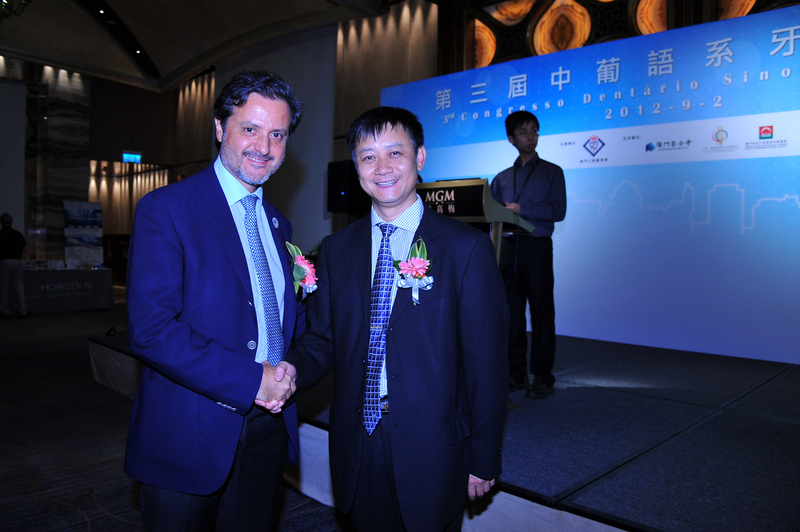 With Silvio Cecchetto, president of the Brazilian Association of Dentists, ABCD. 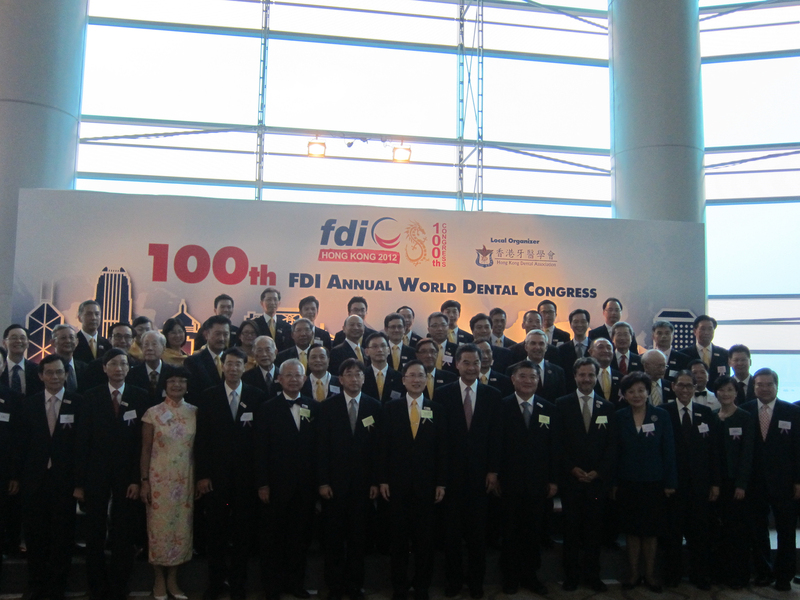 Me, FDI president-elect, TC Wong, and executive director, Jean-Luc Eiselé, among young dentists. 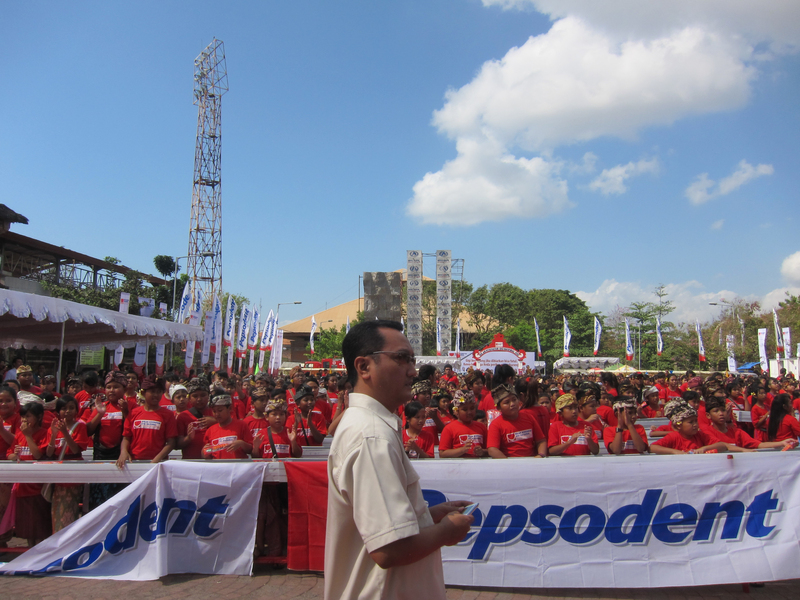 Colgate media briefing “Bright Smiles, Bright Futures” Oral Health Education Program. Group photo at the Unilever booth. 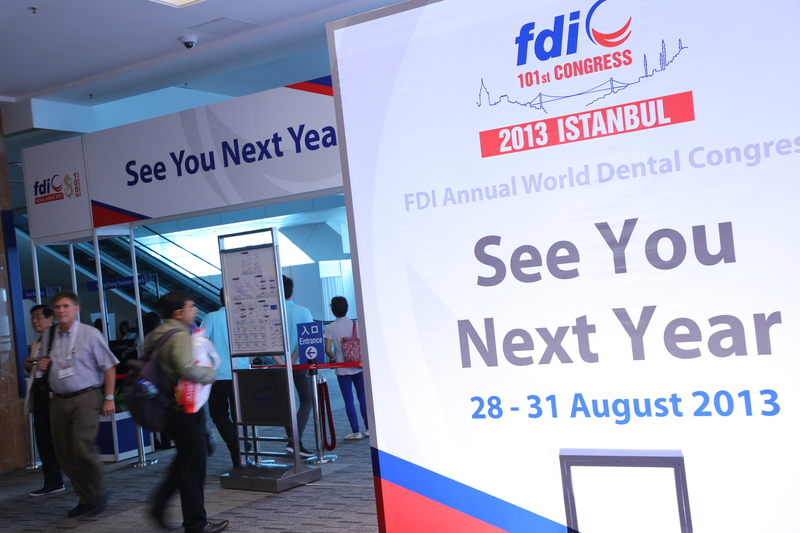 Now we can look forward to moving onwards and upwards at our 101st Annual World Dental Congress, to be held in Istanbul from 28 to 31 August 2013, under the brand name FDI 2013 Istanbul and theme ‘Bridging Continents for Oral Health’. 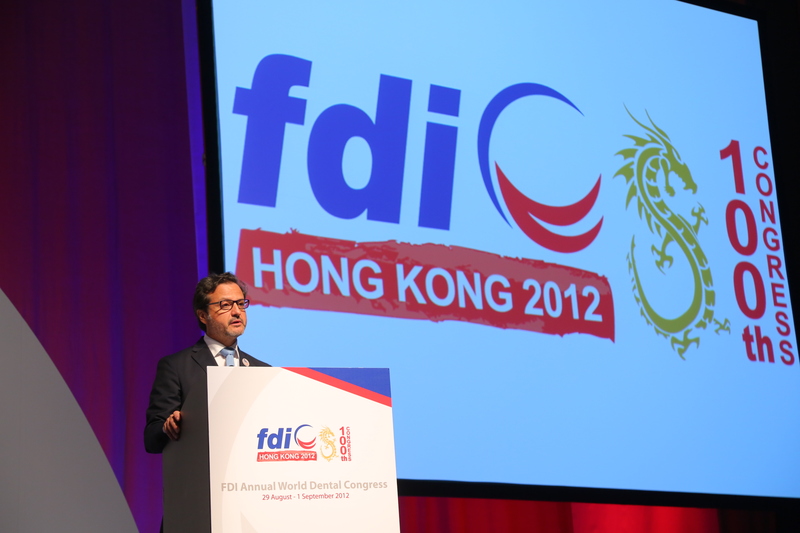 Taner Yücel, president of the Turkish Dental Association presenting the 101st FDI AWDC in Istanbul, 2013. From Hong Kong to Istanbul. 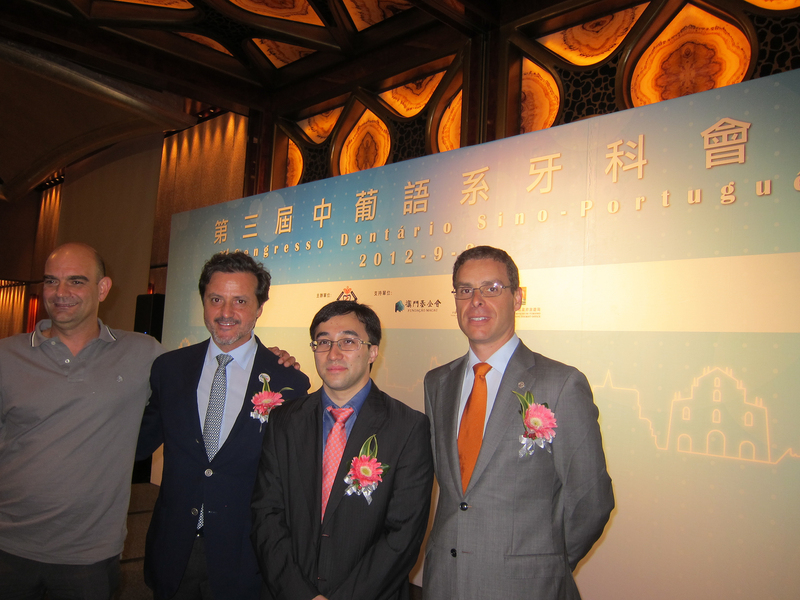 Sigmund Leung, myself and Taner Yücel. From 28 to 31 August 2013. You are currently browsing the Orlando Monteiro da Silva blog archives for September, 2012.